During the month of May Happy Hour City will be celebrating all things wine related. Each week we will educate you on the different types of wine, we will also show you how to make wine centered cocktails/drinks, and we will be giving you the inside scoop on some of the best wine bars & wineries around LA. When you think of wine, the first color that pops into people’s heads is a red tinted purple, after all this is the most popular version. It’s embedded in history, in the Bible, and in everyday cultures. For some reason, red wine is the wine of wines, despite how many other colors and grape varieties there may be, red grapes are the grape to rule them all. So sit down, buckle up, and pour yourself a glass, because we set out to find out why and other mounting questions. -Red wines get their color from the winemaking process, which is based on fermenting the juice in contact with the grape skins to extract color, sweet tannins, and many other compounds. We also know that there are many types of red wine, which vary in taste and color, almost too many to name. The most common varieties include shiraz, merlot, cabernet sauvignon, pinot noir and zinfandel. 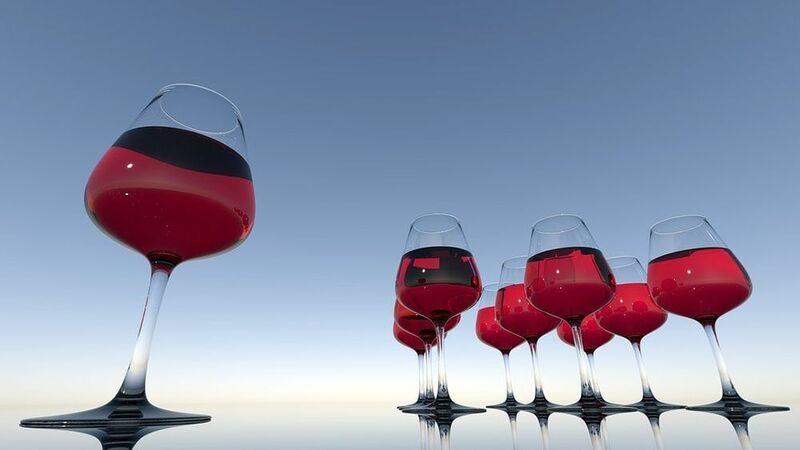 -The alcohol content of red wines usually ranges from 12–15%. Whether it’s because our ancestors drank it more than water or not, red wine has always been tied to numerous health benefits. The powerful plant compounds found in reds include a numerous amount of antioxidants, they have also been proven to help reduce inflammation, lower risk of heart disease and cancer, and extend lifespan. This is sometimes mistaken as ill advice, but that’s only because people don’t understand the concept of moderate wine consumption. So, drink more wine moderately, live longer- simple rules to live by. Historians credit the origin of Viticulture with the same one as wine. You can’t technically disagree, the first humans who learned that fermenting grapes was a “thing” had to study them thoroughly. So fast forward a few thousand years… The practices of Monks in Medieval times following the fall of the Roman Empire have been dated as the first recordings of Viticulture. Many of their practices and findings became staples for Viticulture in 18th century Europe. It was also around the mid-1400s that other varietals such as terroir began to be considered in Viticulture. Before that, it was all about the grapes, then came the weather, the terrain, the time of year, and all the varietals that have become vital to winemaking today- which in turn changed wine production to quality over quantity. It’s safe to say, winemaking is one thing humans haven’t completely exploited and ruined. Nowadays, plenty of people have turned Oenology and Viticulture into careers and lifestyles. Sommeliers spend years in school studying wine and wine-making procedures, a curriculum that involves science, biology, horticulture, some math, and best of all- the use of all our senses. The top 3 wine regions (France, Italy, and Spain) in the world make enough wine to fill 5,127 olympic-sized swimming pools.